Rosemary is a woody, perennial herb which is native to the Mediterraean and grows wild all over Italy. It grows and spreads profusely and hedges of it can be seen by the sides of roads, in gardens, fields and town centres. It is actually a member of the mint family and its name comes from the latin for 'dew of the sea' with the latin word 'ros' meaning 'dew' and 'marinus' meaning 'of the sea'. 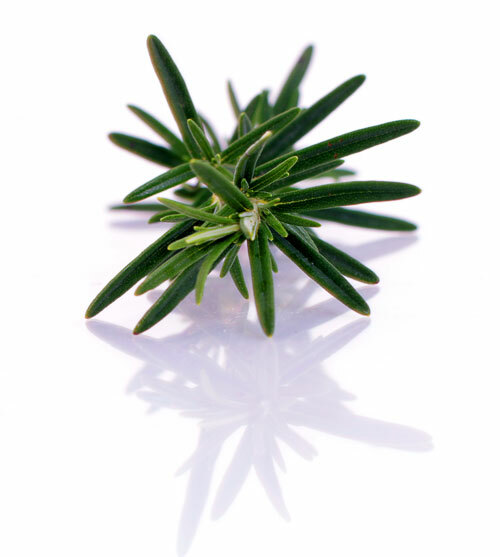 Rosemary is a highly aromotic evergreen plant with a fibrous root system. It grows to a height of around 1.5 metres. The leaves are shaped like needles and are between two and four centimetres in length. It flowers, usually in the spring with a profusion of small, blue flowers but they can also be purple, pink or white. The plant is extremely resistant to drought, spreads quickly and can be grown and pruned easily making it an attractive and useful addition to the garden. It also grows well in pots and needs very little care. The leaves are also considered to have a good pest control effect. The leaves of the rosemary plant are used extensively in cooking and in Italy the herb is a popular flavouring for meat and is used in savoury biscuits and crackers. It needs to be used very sparingly as it has an extremely strong flavour. Oil is extracted from Rosemary and is used to perfume body creams and hair products. It is also used in room fresheners and cleaning products and can be burnt as incense. 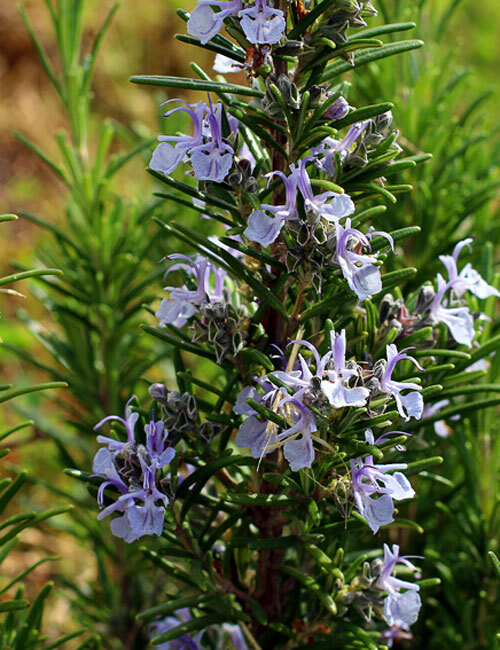 Rosemary has been used extensively over the centuries for its medicinal properties. Traditionally it was used to alleviate muscle pain, improve the memory, boost the immune system, help circulation and to promote hair growth. Recent scientific studies have proven that rosemary is beneficial for enhancing the memory and concentration as well as slowing the aging process of the brain. At Kyoto University in Japan researchers discovered that rosemary contains carnosic acid which has the ability to fight off free radical damage in the brain. Early Greek scholars used to wear a garland of rosemary on their heads during exams in order to aid their memory. Napoleon Bonaparte used Eau de Cologne which was made from rosemary. The herb is mentioned in five of Shakespeare's plays. In the Middle Ages, rosemary was considered to be the symbol of happiness, loyalty and love and was associated with wedding ceremonies. The bride wore it in her hair while the groom and wedding guests wore of a sprig of it. It has always had a reputation for improving the memory and is often used as a symbol of remembrance during war commemorations and funerals. According to legend, rosemary originally had only white flowers but these were changed to blue ones when the Virgin Mary rested her cloak over the herb during her flight to Egypt.